Twitter has gone bananas as many have started wondering if Canadian Prime Minister Justin Trudeau was wearing fake eyebrows during a joint press conference for the G7 summit with French President Emmanuel Macron. 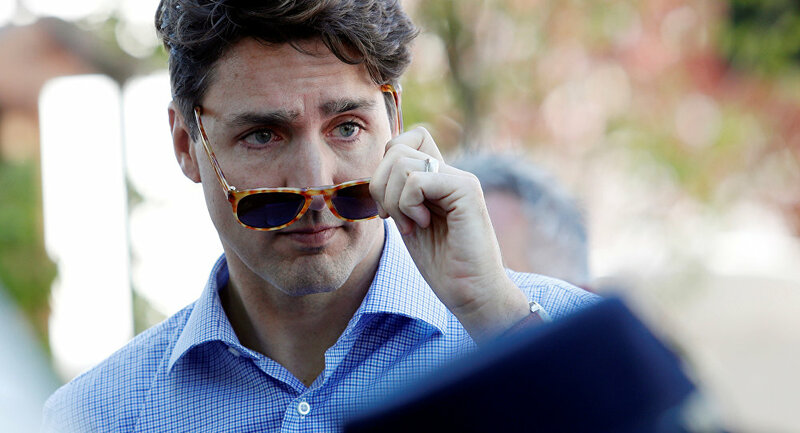 US President Donald Trump’s stance on trade and import tariffs, as well as his Twitter rant targeting the Canadian prime minister has raised eyebrows across the G7 summit… except for Trudeau himself, whose dark eyebrow appeared to slide down his face as he spoke. — Tim Young (@TimRunsHisMouth) 10 июня 2018 г. ​While it might have been the camera angle, or a lighting issue, Twitter users were quick to suggest that the prime minister was wearing fake brows, and that’s when the madness began. I tell people there's a Canadian Prime Minister that wears false eyebrows, but they don't believe me. — Timmy Tour (@TimmyTour) 11 июня 2018 г. — Rachel McGovern (@rmcg2799) 10 июня 2018 г. — JobCentreSUCKS (@DWPscumbags) 10 июня 2018 г. — Madison Gesiotto (@madisongesiotto) 11 июня 2018 г. — Darrell Coomes (@heybanner) 10 июня 2018 г. Nose hairs sticking out, it happens. Food in your teeth, no biggie. — Eddie McClintock (@EddieMcClintock) 10 июня 2018 г. This could have been the day that Trudeau became a world leader but his fake eyebrows ruined it. — John Podhoretz (@jpodhoretz) 10 июня 2018 г. — 🌺🥀Nanda🥀🌺 (@frangiaq) 11 июня 2018 г. — Gov. Mike Huckabee (@GovMikeHuckabee) 10 июня 2018 г. On Saturday, Trump tweeted that he had instructed the House of Representatives not to endorse the final communique of the G7 summit due to Trudeau's "false statements at his news conference," as the Canadian prime minister dismissed US metal tariffs as "insulting" and announced retaliatory measures.